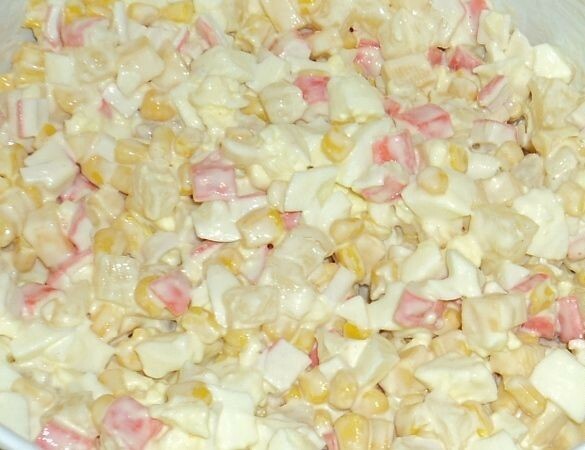 Crab sticks is a popular ingredient used in the preparation of various salads. Salad with crab sticks has a delicate and soft taste, so it is a great option for snacks on the festive table. Shred pre-thawed crab sticks and crumble them in a bowl. Added to the sticks, canned corn, pre-drain her sweet syrup. The eggs boil hard boiled, cooled in cold water and RUB on a coarse grater or shred with a knife. Then you can start cooking rice – this ingredient has virtually no effect on the taste of the salad, it increases the overall weight of the dish and makes it more hearty. Boiled rice washed in cold water and add it to the salad bowl. The finished dish is dressed with mayonnaise, mix thoroughly all the ingredients. Boil the potatoes in their skins, cooled in cold water and peeled. Then all the ingredients cut into small cubes and combine in a deep bowl. With canned peas, and pour out excess liquid and add it to the rest of the products. The finished dish sprinkle with finely chopped dill, dressed with mayonnaise (preferably homemade) and mix thoroughly. 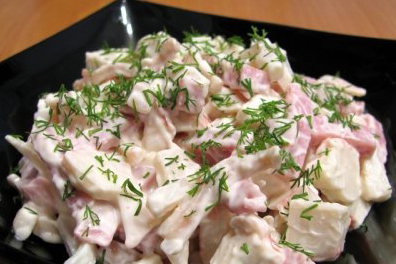 Its composition is a salad with crab sticks and ham reminiscent of Olivier, but instead of pickles, use fresh, crab sticks and give it a more delicate taste. 1 tbsp of soy sauce. 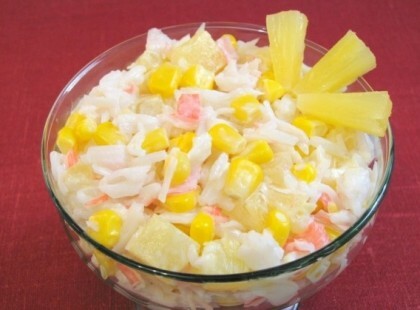 The process of preparation of salad with crab sticks and pineapple is very simple – all the ingredients should be cut into small cubes and combine in a deep bowl. Hard-boiled eggs to grate on a coarse grater and add to the rest of the products. Before you shred the pineapple, they should be wet paper towel to remove the excess syrup. The salad is dressed with soy sauce and mayonnaise, thoroughly mix all ingredients.